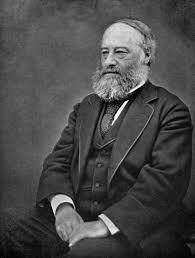 On this day in 1818, James Joule was born. According to Anne Marie Helmenstine, Ph.D., “Joule was the English physicist who helped formulate the first law of thermodynamics. He showed heat energy and mechanical work were related and that energy of a system was conserved. He showed electrical energy and heat energy were interchangeable by relating the heat dissipated by a resistor to the electrical current passing though it. Joule never attended a university and began many of his achievements from a home laboratory where he spent his time after his work running the family brewery (Joule’s Brewery). After the brewery was sold off, he spent the rest of his life pursuing his scientific hobby. He was a major contributor to the new scientific field of thermodynamics and was honored by naming the SI unit of energy, joule, after him.” Thanks to Joule’s achievements, we have more technology available for the brewing process today. Cheers to Joule’s and Joule’s Brewery! Next Post Happy Birthday, Sweet Baby Jesus!